At Steve’s Comics in downtown Northampton, Mike, Raph and Casey are going through some old “Flaming Carrot” back issues when suddenly the joint is besieged by tiny bubble-domed robots with axes and maces. The Turtles and Casey take up arms against the machines, but they aren’t alone: two of the shop’s employees join in the brawl. A short guy with a weird, featureless face transforms into the hero Metalhead, who has devil-horns and can control his metallic hair like tentacles. The shop’s almost-elderly owner knocks out the robots with a metal plate on his forehead, revealing himself to be Stainless Steve Steel. When the last “Domeoid” is vanquished, it plays a holographic recording of a disfigured little man named Dr. Dome, who swears vengeance on all members of the Justice Force. After Mike introduces himself and the others to Steve, the old timer pulls out his dusty J.F. Signal Device to call the other members of the Justice Force: Zippy Lad, Joey Lastic, Captain Deadbolt and Battling Bernice. In a secret lab, Dr. Dome picks up the J.F. signal and revels in the fact that all is going according to plan. Later, in “outer suburbia”, Steve, Metalhead, Casey and all four Turtles arrive at Steve’s mansion (which he paid for by licensing the Justice Force out for comics, movies and television). Steve thanks the Turtles for joining in the Justice Force’s fight. Inside, they’re met by Zippy Lad who, despite being stuck in a wheelchair, is still faster than ever. Joey Lastic eventually shows up, but alas, old age has limited his stretching abilities and he occasionally “goes limp”. Saddest of all is the fate of Captain Deadbolt, a rock-man who could lock his body into an indestructible position at will. While entering a John Travolta look-a-like contest, he froze in a “Stayin’ Alive” pose and has been unable to come out of it. Zippy left him on display at his place, unsure if they guy’s alive or dead. 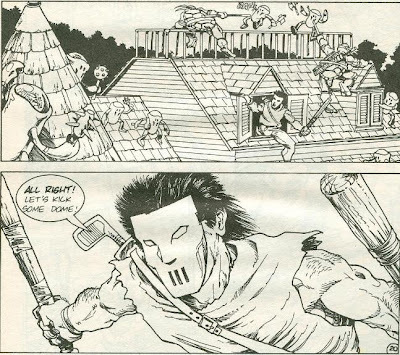 Leo hears several footsteps on the roof and, realizing the assault has begun, orders Raph to stay on the ground floor with the Justice Force while he, his brothers and Casey see to the roof. They make short work of the Domeoids on the roof while the Justice Force and Raph handle the ones coming through the front door. Domeoids destroyed, both teams head outside for more room to fight. They are greeted by Dr. Dome, piloting his gigantic Domebot. Suddenly, Battling Bernice arrives fashionably late and crushes the Domebot with her super strength. Defeated, Dr. Dome confesses that he did it all out of love for her. Bernice reveals that she’s actually Ananda, daughter of the original Battling Bernice who died three years ago. As it turns out, Dr. Dome was originally a member of the Justice Force but left when Stainless Steve Steel won Battling Bernice’s affections. Ananda is ready to give up on Dr. Dome, but Steve isn’t in such a hurry. He offers Dome the opportunity to come stay at his place and perhaps mend old wounds and use his skills for the betterment of mankind to make up for lost time. Dr. Dome accepts. Back at the farmhouse, Raph is reading an issue of the “All-New Justice Force”. Mikey ponders if Steve will be able to rehabilitate Dr. Dome. Raph says they should at least give him the chance, as “time heals all wounds”. *Chronologically, this story is continued from TMNT (Vol. 1) #14. Chronologically, the story continues in TMNT (Vol. 1) #17. *Members of the Justice Force will return gradually throughout TMNT (Vol. 4). Metalhead will return in TMNT (Vol. 4) #1. Zippy Lad will return in TMNT (Vol. 4) #2. Stainless Steve Steel and Joey Lastic will return in TMNT (Vol. 4) #4. *At Steve’s Comics a number of indie titles can be seen lining the shelves, such as “Albedo” and “Trollords”. 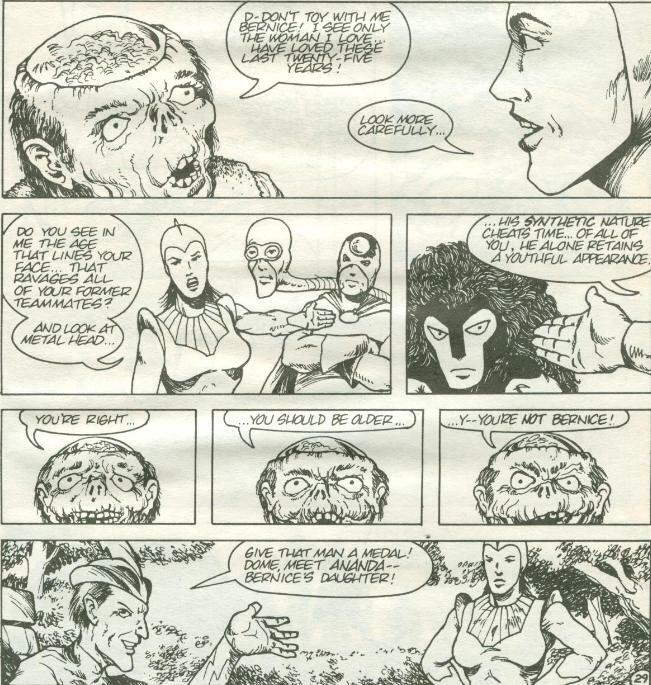 But more importantly than any of that, there is apparently a comic adaptation of “Yor, Hunter of the Future”; quite possibly the worst movie ever made. 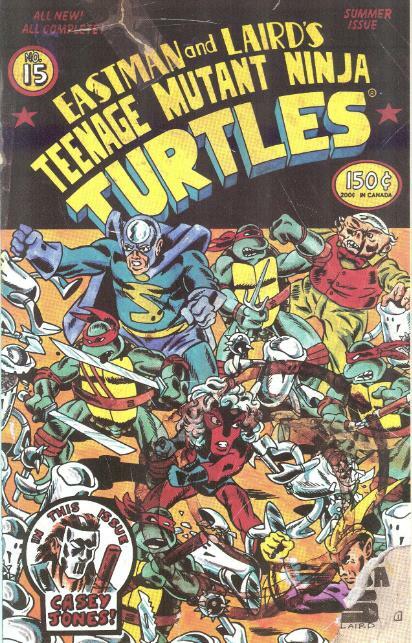 *Due to delay, this issue was actually published a month after TMNT (Vol. 1) #16. *This issue also featured a bonus pin-up by Peter Laird’s brother, Don Laird, and a self portrait of Eastman and Laird in Mirage Studios by Kevin Eastman and Peter Laird (originally seen in Amazing Heroes #107). *This issue was adapted for the 4Kids TMNT cartoon as the episode “Return of the Justice Force”. 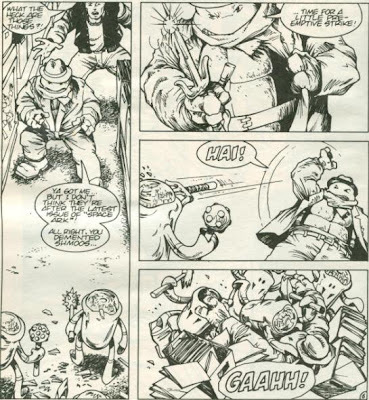 Eastman and Laird made it a point to illustrate that the Turtles live in a world already populated by superheroes and general comic book weirdness fairly early on, with characters like Complete Carnage and Radical, etc. Probably a good idea, as the Turtles so frequently encounter aliens, monsters, super villains and other miscellaneous insanity that there’s just gotta be this sort of stuff waiting around every corner for their world to make any sense. 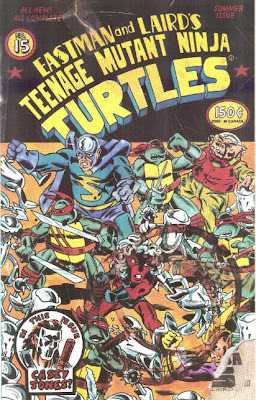 In a way, it makes the Turtles seem a little less unique, as how can they be freaks and outcasts in a world where robot midgets and rock-men can make lucrative licensing deals and be accepted as heroes by the general populace? It actually seems counter-intuitive to Laird’s own personal insistence of reducing mutant animals in the franchise offshoots he has a hand in because it “makes the Turtles less unique”. So bizarre superheroes are okay in abundance, but not mutant animals? Okay, sure, whatever. I don’t hate the presence of superheroes in Turtle comics; Nobody is a favorite recurring character of mine and I adored most of the Image series, which had a ton of superheroes in it. 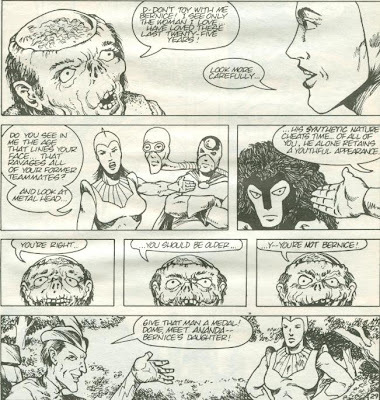 The issue I take with “Dome Doom” is more that it overloads the audience with the fact that “oh by the way there’s a retired team of superheroes operating out of Northampton who license their likenesses out to media outlets to maintain luxurious lifestyles but nobody ever talks about them because meh”. Nothing would really be done with the idea of a substantial superhero population in the Mirage TMNT universe until the Image series, and after that got retconned out of continuity, the Volume 4 series (which had several interesting ideas as well as a decent use of the Justice Force characters). So while this issue lays some groundwork for story elements that’ll come into play in TMNT (Vol. 4), that’s a long freakin’ ways away. Reading the issues chronologically, it’s just this one bizarre tale that seems like it should have major repercussions on the world the TMNT live in but won’t be referenced again for twenty years. The story itself is paced really poorly, relying on the convenient acceptance of the protagonists for one another just so we can move to the next scene and get it all to fit in 32 pages. In a way, though, the issue is supposed to be a throwback to cornball superhero comics from yesteryear, where this sort of storytelling was common place, so I’m willing to overlook it. If you read the letter column in this issue, Laird makes it a point to publish several letters berating him and Eastman for “selling out” via the Fred Wolf cartoon and the Playmates toyline. Laird writes a lengthy reply to these letters, defending his decision to license the Turtles out for millions. Hell, I can’t hold a grudge against him; you better believe that if I could create something worth a fortune I’d milk that cow for every drop I could get. The inclusion of the plot point that Steve has been licensing his identity out for a fortune seems almost like a response by Laird to the accusations of “selling out” from his critics. “I’m sorry, did you say something? I can’t hear you through the walls of my colossal mansion in the gated community I live in thanks to all the money I made licensing my creation”. “Dome Doom” is… I dunno. I didn’t really see its value until Volume 4 rolled around and these characters began making a comeback in supporting roles. But even then, they don’t offer much to the narrative of that series beyond tutors for a rebellious Shadow to blow off and a secret hospital for superheroes that hardly plays any significance to the plot beyond its introduction. If this issue never existed then those plot points would have never existed and I can’t see the series being any the worse without them. All in all, it’s just not an issue I care for one way or the other. i liked this issue for all its cheesiness. it's not much but i do get your point. and i did like the return of metal head on vol 4. he's mysterious, powerful... maybe it's the hair, i'm bald. i don't know. may i ask why the sudden change from tmnta to tmnt? and for the record, is a pleasure to read you, it's one of the few sites i check on almost a daily basis. thanks! 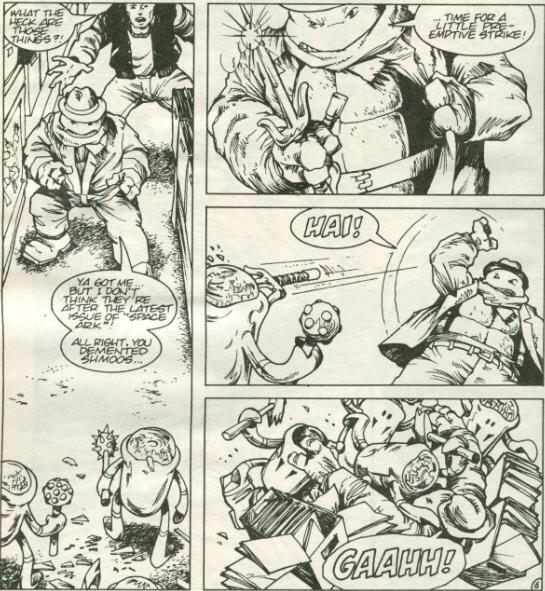 This is one of the few comic book TMNT stories that I feel was unambiguously improved in its cartoon adaptation. The licensing bit is dropped, the plot has more weight to it, and its has more immediate consequences than its comic book counterpart. Given how involved we've learned Peter Laird was in the show's production, I wonders if he feels that way as well--especially since he clearly feels affection for the Justice Force characters. Maybe this is a stupid question, but why was #14 skipped? #14 oddly takes place in the winter because there's snow on the ground, while the surrounding stories take place either in the summer or early autumn. Since the Turtles only spend one year in Northampton, #14 has to take place either right after they got there or right before they left. Since they're still recovering in the winter when they got there, it makes more sense for it to take place in the winter before they left. I'm not sure why it was published out of seasonal sequence, though the majority of stories between #11 and #19 were narrative oneshots being done independantly by the Mirage crew, so it could just be that Eastman's story was ready before the others, so it got published first.